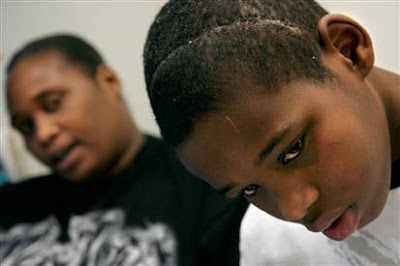 Deamonte Driver, aged 12, is shown above with his mother, Alyce, at Children's Hospital in Washington, D.C., after emergency brain surgery. Sadly, Deamonte died of a tooth infection that had spread to his brain on Sunday. But $250,000 in emergency medical treatments could not. Was Mahatma Gandhi right when he said "I have endeavored to show that there is no real service of humanity in the profes$ion [of medicine] and that it is injurious to mankind"? Do you think that more dentists should be required to accept Medicaid and provide care to poor children? Click here to vote YES: It is shameful that a child in the U.S. could die from something as easily treatable as a tooth infection. Read the Post story here. Every lawmaker on Capitol Hill should read "For Want of a Dentist; Pr. George's Boy Dies After Bacteria From Tooth Spread to Brain" [Metro, Feb. 28]. Every state legislator and governor should read it. President Bush should read it. There is no excuse for such a heartbreaking waste of life -- especially in a country as wealthy as ours. In addition, institutions including schools, community centers and houses of worship should be teaching community members to brush their teeth every day and to avoid sugary drinks and candies. One does not need special training to teach those practices, and they would make a significant difference to everyone's health. As a father and a dentist, I was greatly saddened by the death of Deamonte Driver. In my mind the problem starts with education. The public simply doesn't understand the seriousness of dental disease, especially in children. The general feeling seems to be "it's just a baby tooth." As this story showed, dental disease can kill. Dental decay is an infectious disease that starts small and, left unchecked, can penetrate a tooth's nerve chamber. Once the nerve is infected, the infection is free to move throughout the body. In my opinion . . . it is the dental profes$ion that must change. Not the amount of taxpayer or government spending. Refusing to accept Medicaid insurance is a form of health care discrimination and should be illegal. Health care discimination kills. We can all, as health care consumers and taxpayers refuse to support these ruthless business people (a fact, not opinion) and bigoted killers (a fact, not opinion) - our so called health care providers - by spending our money and handing over our insurance cards only to dentists who accept our tax dollars (Medicaid) and/or help the poor and who are 100% human. When you support dentists who discriminate, you support discrimination. Please . . . boycott dentists who discriminate against Medicaid children! Read "Deamonte Didn't Have to Die" by Cato@Liberty here. COMMENTS from Karmabanque Radio here. Read <great blog> "Our Brave and Uninsured Kossacks Inspire Awe" by Daily Kos here. Read "The Next Battle: Medicaid" by Daily Kos here. Read "AfFRAUDable Healthcare" by Daily Kos here. An excellent (although unlikely) solution: Read "Healthcare Economics: Diseases Are Too Profitable to Prevent or Cure" by Mike Adams here. Read "Health Care Reform Legislation That Congress Should Pass, But Won't" by Mike Adams here. It should not be considered 'shameful', because its not an 'act'. Its the timely nature of a said illness, and the untimely action taken in the same direction. It is an act when a dentist refuses to accept a Medicaid or poor patient. Doctors and dentists have the right to refuse any patient. Their exercise of that right is an act. There is also something called an act of omission. The question was: Do you think that more dentists should be required to accept Medicaid and provide care to poor children? Therefore, the act, or intentional failure to act, by the dentists who do not accept Medicaid or help the poor, is shameful. And obviously you didn't vote YES. So, shame on you!